As I endeavor never to lie to you kind folks who stop by and read my thoughts, I have to say I was really having second thoughts about reading All the Truth That's in Me when it was put into Sadie Hawkins. I'd heard rumors of dialect, and, though I've enjoyed a couple of books written in dialect, it's still not really my thing. The style of it generally scared me off. 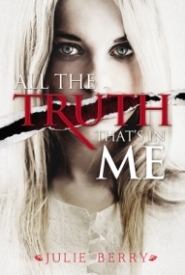 However, All the Truth That's in Me ended up being a really rewarding and unique literary experience. I really do feel like All the Truth That's in Me is an excellent novel, well-written and perfectly atmospheric. The dialect really isn't strong at all, kept to a minimum and conveyed more with phrasing and the occasional word, like "hisself" for example. The language is kept pretty simple, which generally annoys me, but works well here. Judith isn't well-educated, and she was reticent even before her tongue was cut out. Oh, right. Yeah, her tongue was cut out, so she's mute. Did I forget to mention that? Judith is, I think, unique among YA heroines in that her tongue has been cut out. How intense is that? She was kidnapped and mutilated. This aspect is what I liked best about All the Truth That's in Me. It's dark, hard, and not sugar coated in the least, yet there's still a sense of hope. See, Judith had pretty much given up on herself, and was beginning to believe what others said: that she's dumb. With the outbreak of battle, though, Judith throws herself into action to rescue the boy she's loved since childhood. To do so, she has to confront her captor, and sets in motion events that will force her to learn to speak up for herself or else. Like Speak and The Girl in the Park, All the Truth That's in Me centers on the importance of finding your voice. The mystery of who kidnapped Judith and what happened to her there, as well as who murdered Lottie, who disappeared just before Judith did, is really well done. The first fifty pages or so of the novel are really confusing, told in snippets of past and present all jumbled up, but it really does come together, and, once I got used to it, the jumps didn't feel unnatural at all. The way Berry wove everything together really did impress me. There is some romance, but it does not overwhelm the larger arc. At first, I really didn't like it, because Judith is quite the little stalker. By the end, though, Berry had me sold on it. For one thing, I'm a real sucker for heroines who aren't gorgeous or who have disabilities finding love just like the model beautiful ones do. What Judith went through was not her doing and does not make her unlovable, though perhaps her own sense of being unlovable might if she gives into it. Lucas, her crush and love interest, is a really sweet guy, and hurrah for more of these sorts of guys cropping up in young adult fiction these days. Still, though I liked the writing for the most part, second person narratives really don't work for me. The whole of All the Truth That's in Me is written this way. The you in question is Lucas. Unless a story is written in a diary format, epistolary, or breaking the fourth wall, I just do not comprehend the point of second person. For me, I'm thrown out of the text every single time I come across the word you in the narration, because I know it's not me. Plus, it has the disconcerting effect of putting me in two roles at once: looking through Judith's eyes, but also cast as Lucas, which was a bit dizzying. Presumably there was a reason for this, but, whatever it was, this is not a style that is effective for the sort of reader I happen to be. The other aspect that left me a bit disappointed were the historical elements. Not much was really made of the history, and it all felt overly vague to me. I kept trying to place the novel in time and location, but never really got close. All told, All the Truth That's in Me is a powerful, highly original novel and I recommend it highly, particularly to readers with more patience for second person narration.